Get down, get down, get down shouted someone far below us. Getting down was hard to do as we were walking down a metal staircase in single file that was attached to a huge rock wall. We all crouched down with looks of confusement and puzzlement. Then we realized what was happening as we saw the large black shape move below us very quickly. Across from me were a group of Chinese tourists on their way up to the summit of Sigiriya Rock. They were chatting away loudly until the whole staircase told them to shhhh. In this situation it was imperative we all stayed still and quiet. 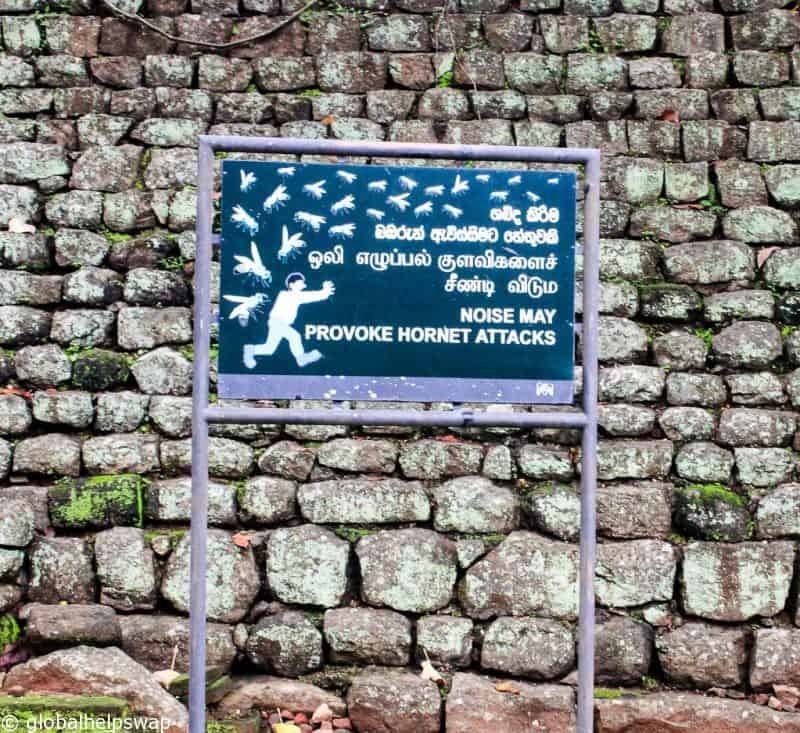 Obviously, their tour leader did not warn them about the vicious……… hornets. Thankfully we all escaped the close shave without any incidents. It was quite intense though. 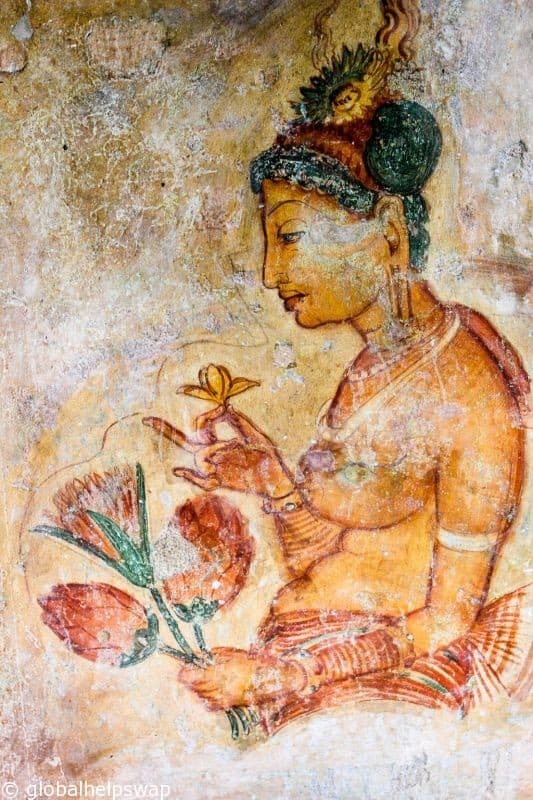 It just shows you that even after 1,500 years, Sigiriya Rock is still being protected. 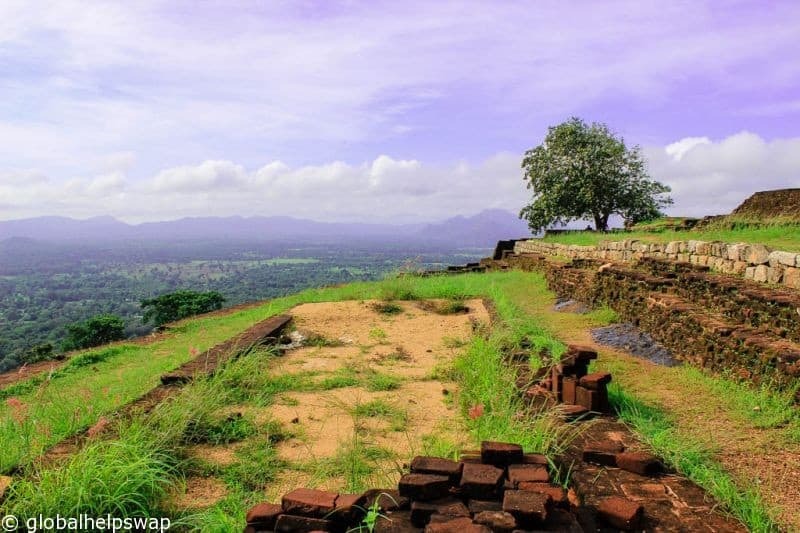 Sigiriya Rock was a royal citadel built by King Kashyapa. 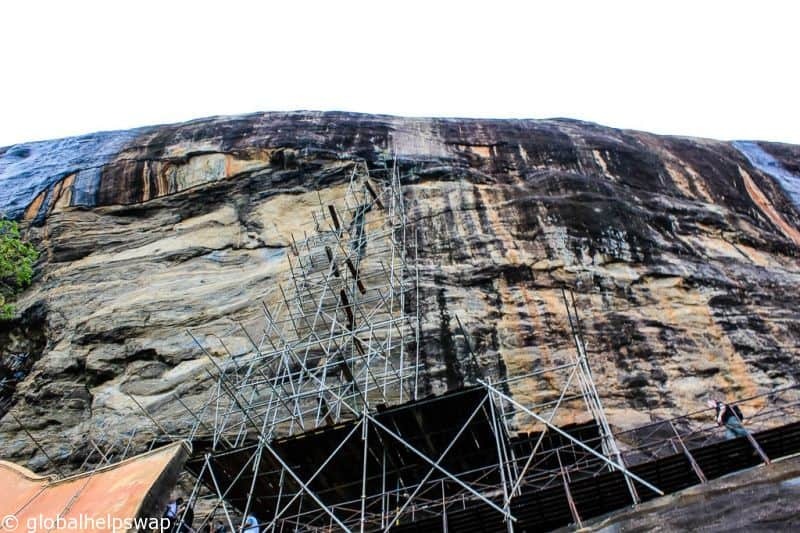 The King built his palace on top of the rock believing it to be impregnable. It almost was. The King’s half-brother Moggallana challenged the King with his army. There was a great battle on the plains below the rock and when the King thought that the battle was lost, he committed suicide. Nowadays apart from the hornets the only thing you need to worry about is the heat. 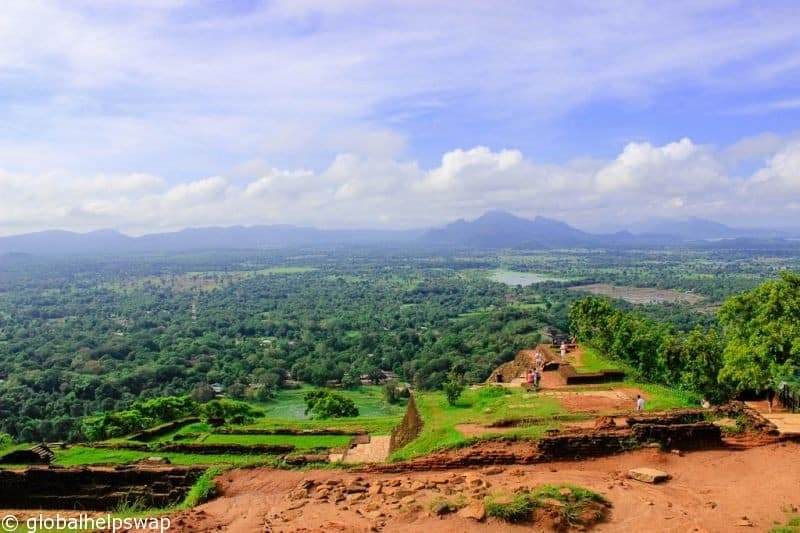 Climbing Sigiriya Rock is strenuous but not too hard. Remember to go early (before 09:00) and to take water with you as it heats up very quickly. 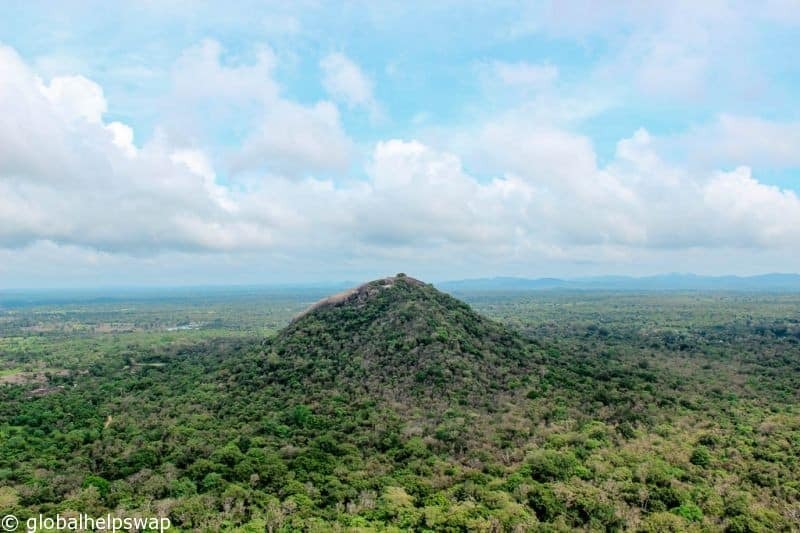 There are roughly 1,200 steps to reach the summit but believe me its worth it. The first stage is through the gardens at the foot of the rock. When we visited there were a few cheeky monkeys hanging about. The gardens lead you to the “Mirror Wall” which used to be so polished it acted like a giant mirror. Sadly the plaster has long gone so you won’t be able to see how hot you are on the way up. The next stage leads you to the Fresco wall. This came as an excellent surprise for me as I had no idea they were there. Sometimes us Travel Bloggers do tons of research before visiting a place, which takes a lot of the surprise element away. The frescoes were stunning. They used to be part of a giant tapestry of 500 semi-naked females that would form a band around the rock. 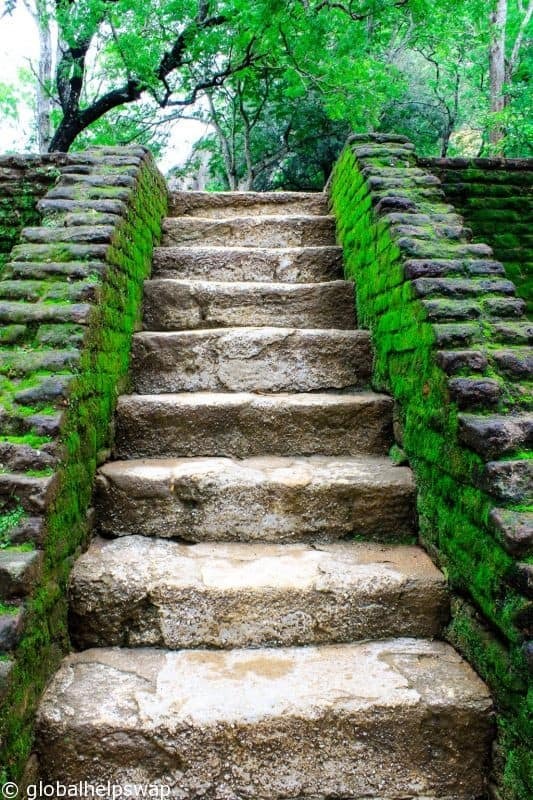 The final stage is the ascent to the summit and The Sky Palace. 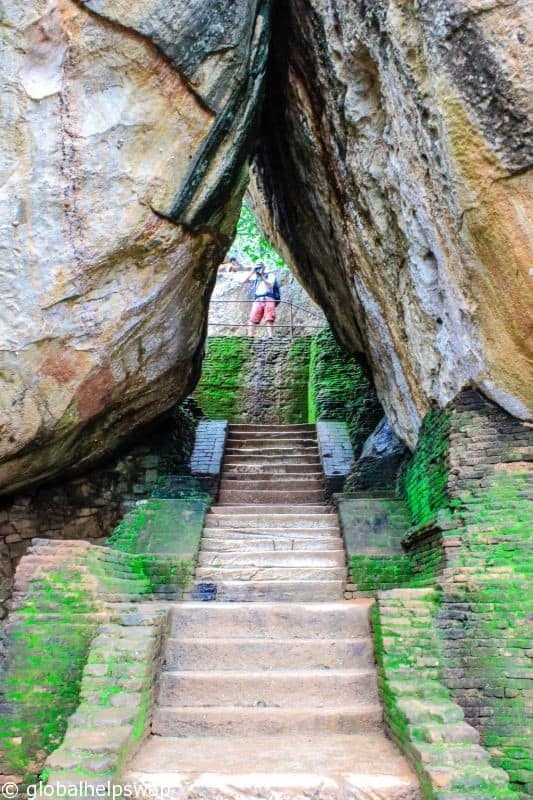 You start the ascent at the Lion Staircase. 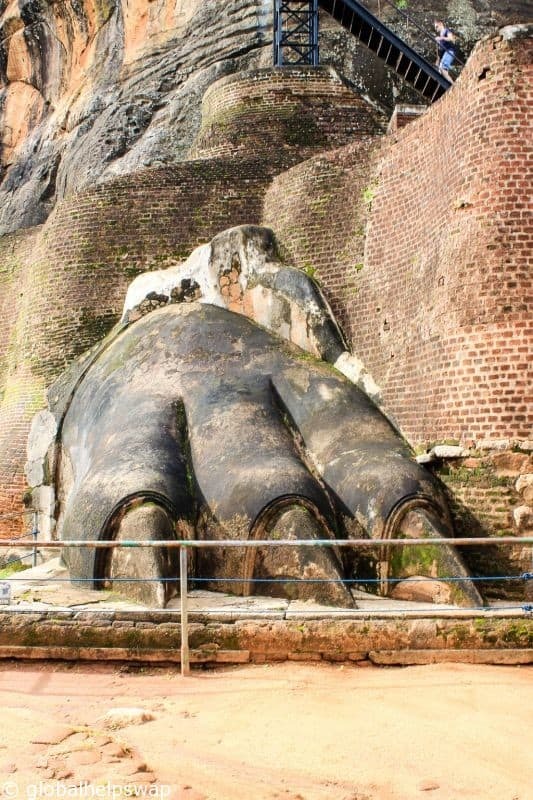 The paws and staircase are all that remain of a once colossal gatehouse built-in the form of a crouching sphinx-like lion. This is the most challenging part of the climb so have a break before you start your ascent. It is also the part where we had to sit down when our friends the hornets visited. Once you reach the top you will instantly see that it was worth all the effort. The views of the surrounding area are stunning. This is where you will come to appreciate the gardens at the foot of the rock too. 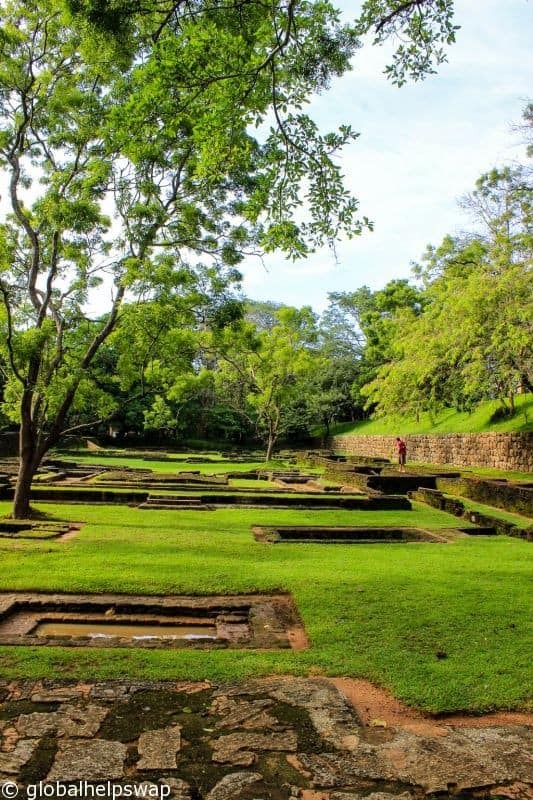 The Gardens of the Sigiriya city are one of the most important aspects of the site, as it is among the oldest landscaped gardens in the world. The palace itself must have been beautiful. Visible for miles around, the Sky Palace appeared to float above the treetops as though on a gleaming white cloud. Imagine witnessing that for the first time. 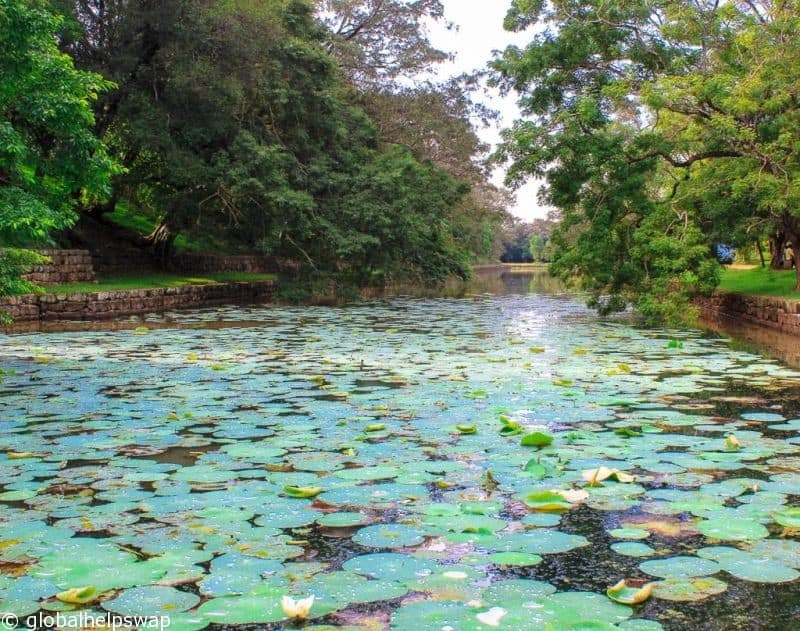 The palace was a collection of open and airy buildings and pavilions set amongst luscious tropical gardens and ponds. This was to keep the buildings cool during the hot summer months. In fact the palace was only used in the summer. 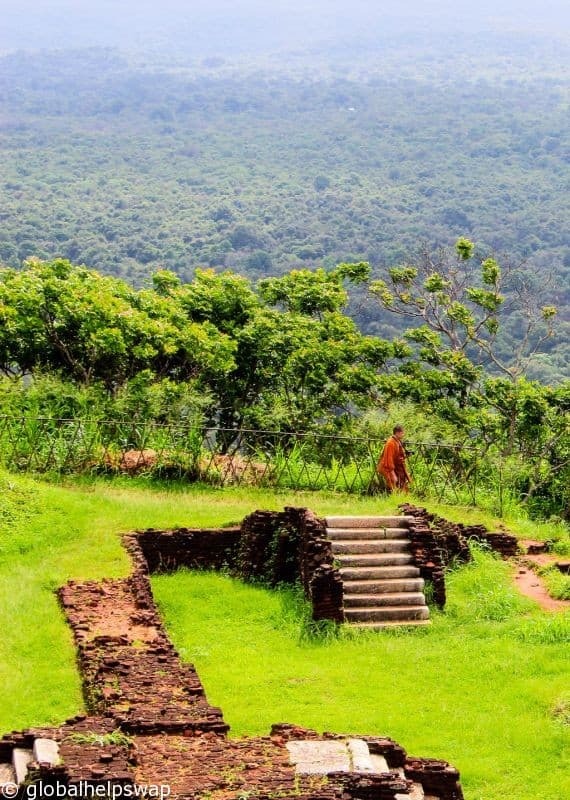 In the monsoon season the King would retreat to a palace at the foot of the rock. Oh to have more than one palace! Take your time when you are at the summit. Try to find a quiet place and look at the amazing vista. It must have been one hell of a place to live. 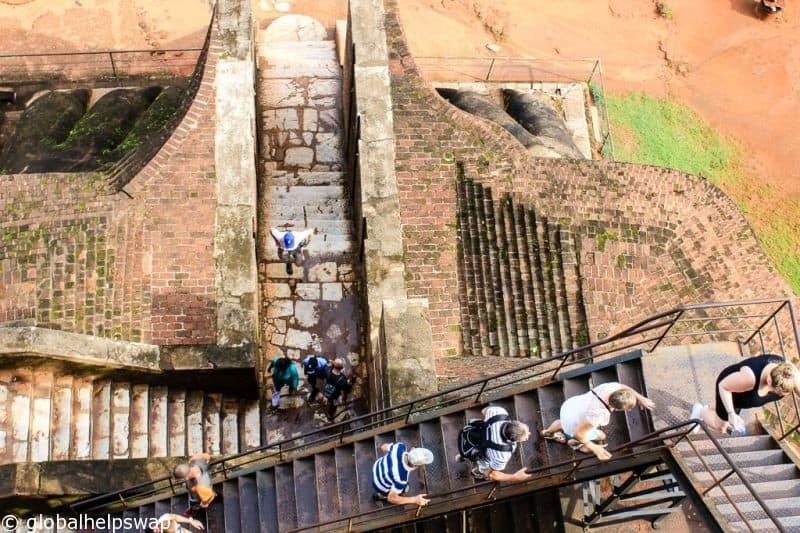 The walk back down takes roughly 30 mins, unless you come across the hornets and then it may take slightly longer! Just remember to crouch down and not to shout. 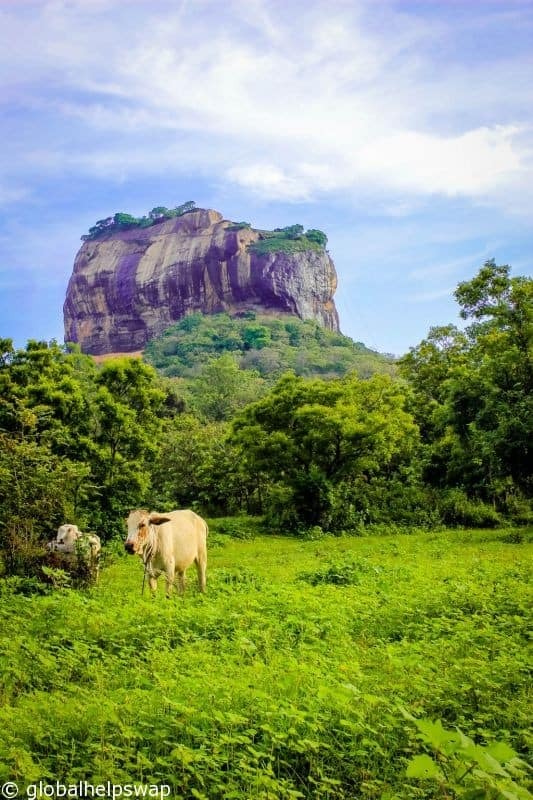 I would like to thank Cinnamon Hotels and Sri Lankan Airlines for inviting me to Sigiriya Rock. As always, opinions are my own. Yeah, those pesky wasps are quite the trip. It really does pay to shut up when you are on that face of the rocks. I was ready for a fat eye, but luckily we escaped it. The climb is worth it though, despite the steepness. Well done. Thanks Kerwin. We were considering what was worse; being stung or jumping down! You will love it Yve. Let us know before you go! Thanks for the comment. Yeah! 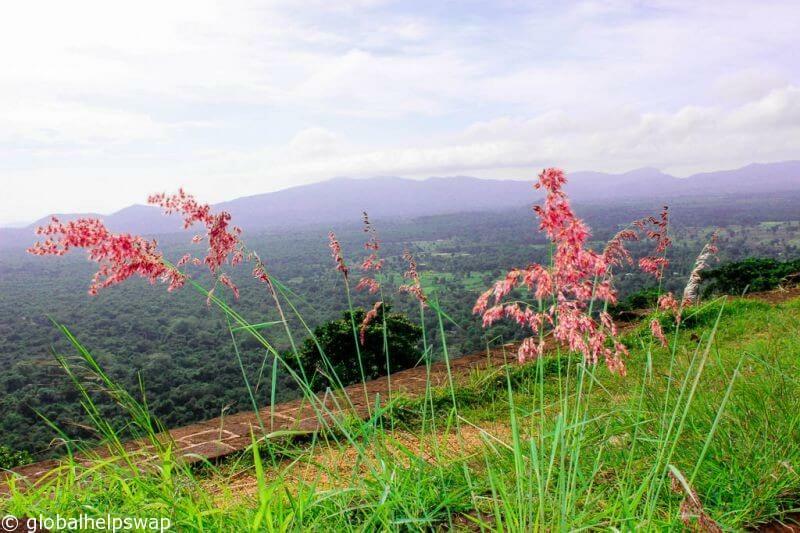 sri lanka is the best place for hill climbing. 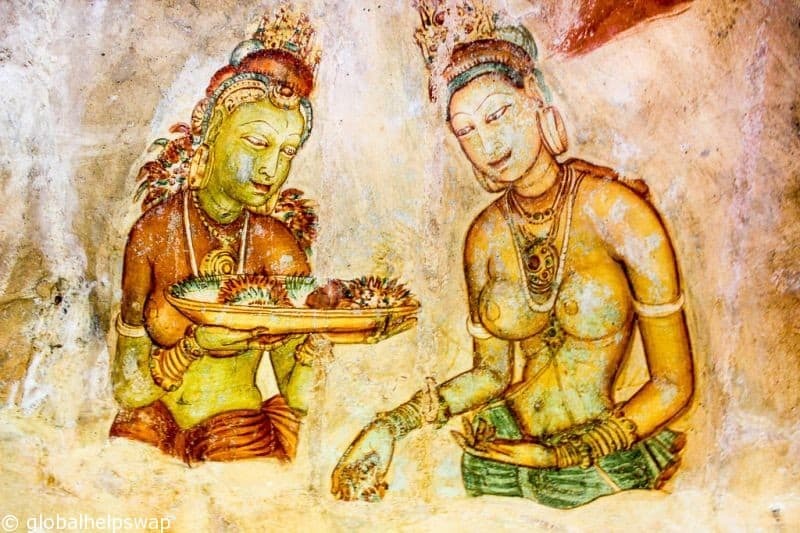 I did this last month wonderful experience in srilanka. We are glad you enjoyed it too! Thanks for the comment!